Enjoy your music collection and games with HP S3100 USB Speakers (Black).It is made up of amazing quality and has clear sound. Here is a nice deal. 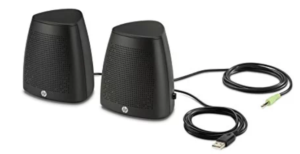 Amazon is selling HP S3100 USB Speakers (Black) worth Rs.1299 at Rs.475 Only + 15% cashback. Buy Now! !